Everyone's comparing Donald Trump Jr. to Fredo Corleone. Quit it. 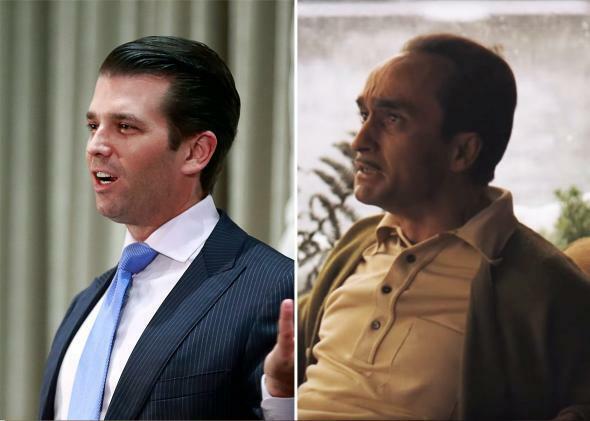 Comparing Donald Trump Jr. to Fredo Corleone Is Grossly Unfair. To Fredo. Donald Trump Jr., left, and John Cazale as Fredo Corleone in Godfather II. Photo by Jeff Vinnick/Getty Images. Still by Paramount Pictures. As a firm grasp on reality has become increasingly inadequate to explain the behavior of the Trump administration, we’ve turned increasingly to works of fiction, from King Lear to the Harry Potter series, in hopes of finding some way to make sense of it all. With the latest scandal involving Donald Trump Jr., one comparison in particular seems inevitable. We should stop calling junior Don. We should start calling him Fredo. I haven't seen The Godfather, but based on all the comparisons to Donald Trump Jr., I assume "Fredo" was the name of like, a very dumb goat. According to the Daily Beast, the comparison to The Godfather’s hapless scion isn’t just the province of cultural commentators and social media wits: “Fredo” has been some Trump insiders’ nickname for Don Jr. since the early days of the presidential campaign. Some of the Don Jr.–is–Fredo crowd have already acknowledged the flaws in the analogy, namely that it would, by extension, make Donald Trump the equivalent of Vito Corleone. But you don’t have to play out the string that far to see where the likeness comes up short. Comparing the son of the president of the United States to the impotent, treacherous brother of a fictional Mafia don is grossly unfair. To Fredo. Yes, Donald Trump Jr. is, like Fredo Corleone, a coddled, semi-competent adult child who owes whatever success he has found in life entirely to his family connections. Sure, Don Jr. managed to compound his disastrous attempt to “help” his father’s campaign by meeting with a Russian lawyer promising dirt on Hillary Clinton by posting his own incriminating emails to Twitter, much the way Fredo claimed to be aiding his brother, Michael, in making a deal with Hyman Roth by conspiring behind his back and unwittingly set Michael up for an attempt on his life. And OK, both Don Jr. and Fredo seem to have spent their lives struggling and failing to escape the enormous shadow of their successful fathers. But part of what makes Fredo Corleone such a great and enduring character is that he just wants, at heart, to be respected and, in the case of his brother, loved. He’s not a hateful or violent man, just desperate and sad. Donald Trump Jr. killed a baby elephant for sport and posed with its severed tail; when assassins made an attempt on his father’s life, Fredo was too flustered to even hold a revolver. Don Jr. has been Donald Trump’s hatchet man, doing the dirty work that his father was too smart to sully his hands with. Fredo is a puppy dog; Don Jr. is an attack dog.